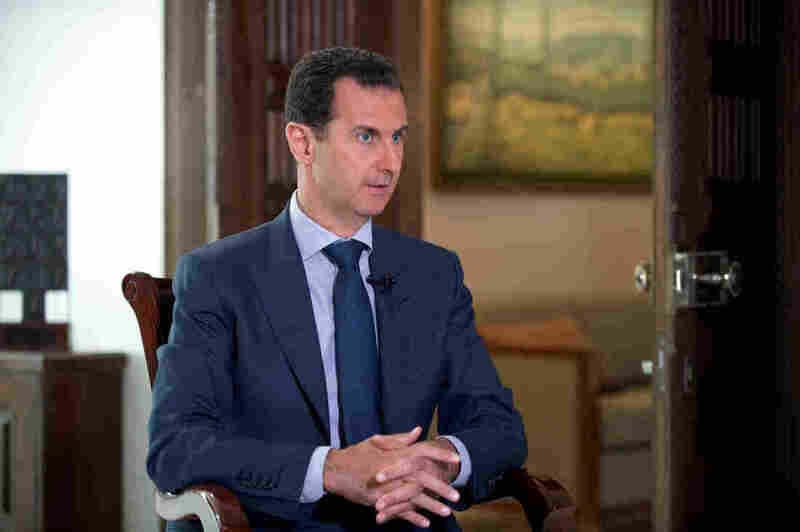 Syrian President Bashar Assad Says U.S. 'Not Genuine' About Cease-Fire : The Two-Way In an interview with The Associated Press, Assad blamed the U.S. for the collapse of a fragile truce earlier this week and denied carrying out well-documented human rights abuses. Syrian President Bashar Assad at the presidential palace in Damascus. In an interview with The Associated Press, Syrian President Bashar Assad blamed the U.S. for the collapse of a fragile cease-fire earlier this week and denied carrying out well-documented human rights abuses, such as besieging civilians or using chemical weapons against them. "I believe that the United States is not genuine regarding having a cessation of violence in Syria," Assad told the wire service. The Syrian government announced Monday that it was unilaterally ending the cease-fire, as we reported. Assad also suggested that the U.S., which leads a coalition against ISIS that has been conducting operations in Syria for two years, "doesn't have the will" to work against ISIS and other extremist groups. The Syrian leader "cut a confident figure during the interview — a sign of how his rule, which once seemed threatened by the rebellion, has been solidified by his forces' military advances and by the air campaign of his ally Russia, which turned the tables on the battlefield last year," the wire service reports. The Syrian war has entered its sixth year, and the latest U.S.-Russia brokered cessation of hostilities collapsed this week. During the weeklong truce, there was a lull in violence rather than a halt. The atmosphere of mistrust only increased after the U.S.-led coalition hit Syrian troops on Saturday. U.S. Secretary of State John Kerry called it a "terrible accident." Assad said the aerial bombardment wasn't in error, claiming that it involved four planes and lasted more than an hour. "You don't commit a mistake for more than one hour," he said. A Central Command official told The New York Times that Russia notified the U.S. military that they were hitting Syrian troops 20 minutes after the bombardment began. On Monday, a U.N.-coordinated aid convoy heading to besieged areas in Aleppo was attacked, killing approximately 20 civilians, according to the Red Cross. U.S. officials blamed the deaths on airstrikes from Syria and their Russian allies — allegations that Assad denied during this interview. "Those convoys were in the area of the militants, the area under the control of the terrorists," he said. "We don't have any idea about what happened." The rebels fighting against Assad's government do not have an air force, and Assad said there were "no airstrikes against that convoy." However, as NPR's Alison Meuse reported, an eyewitness said that "the attack consisted of helicopters and warplanes." She added that many reports from Aleppo that night said there was "heavy bombardment by Syrian warplanes and their Russian allies." During the course of the AP interview, Assad also repeatedly denied assertions that his government's troops have carried out a broad range of human rights abuses and criminal actions, insisting that such actions would defy logic. "We don't kill civilians, because we don't have the moral incentive, we don't have the interest to kill civilians," he said. In April, the U.N. special envoy for Syria estimated that 400,000 people have died in the Syrian war. The Syrian Observatory for Human Rights, an opposition-leaning monitoring group, put the number at 300,000 confirmed deaths, one-third of which are civilians, as NPR's Alice Fordham reported. "Another report by a human rights group found Assad's Russian allies killed about 2,700 civilians in the first eight months of their air support for him. "Throughout the five years of Syria's civil war, doctors, activists, commanders and civilians have described civilian fatalities as a result of regime attacks to NPR reporters on a daily basis." Assad denied using chlorine gas and barrel bombs against civilians. "A recent joint investigation by the U.N. and the Organisation for the Prohibition of Chemical Weapons found at least two occasions when government forces used weaponized chlorine," as Alice reported. At one point during the AP interview, Assad denied restricting access for aid convoys to besieged cities. Speaking about Aleppo, where rebel-held areas have been intermittently under siege for months, he said, "If there's really a siege around the city of Aleppo, people would be dead by now." He also claimed that his forces "don't attack any hospital," saying that such actions would be "against our interests." However, as The Guardian has reported, aid organizations "are refusing to share GPS coordinates with Russian and Syrian authorities because of repeated attacks on medical facilities and workers." Last month, Doctors Without Borders said warplanes destroyed a busy hospital in Idlib governorate, "killing 13 people and depriving 70,000 of essential medical care." Speaking about the nearly 5 million refugees who have fled the violence in Syria, Assad called them a "great loss." He told the AP that "I'm sure that the majority of those Syrians who left Syria, they will go back when the security and when the life goes back to its normality and the minimal requirements for livelihood will be affordable to them, they will go back. I am not worried about this." However, Alice said many of the Syrian refugees she interviewed told her they are too afraid of Assad's security forces to return home, even if there is peace in Syria.